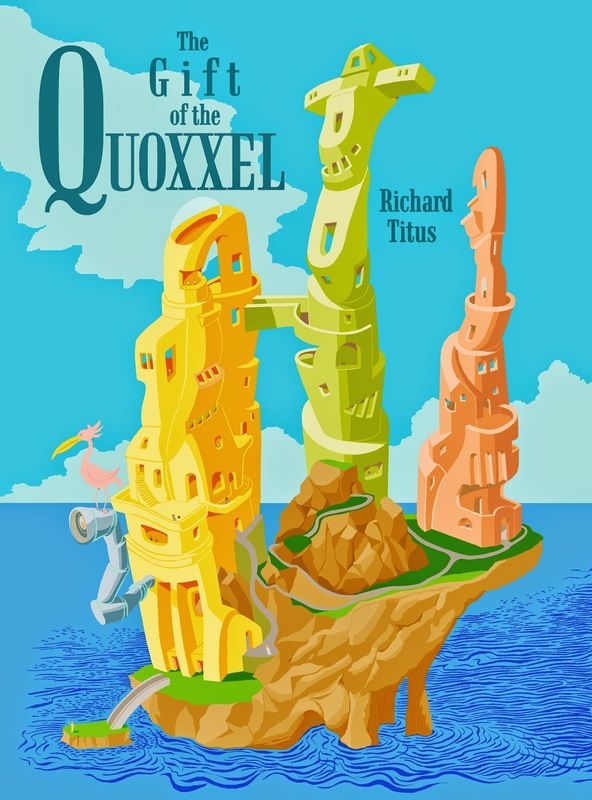 Today we are interviewing Richard Titus about his YA fantasy novel The Gift of Quoxxel. Your “basic, garden variety, introverted arts nerd” about sums it up. My mother recalls that I was “always making something.” With my dad’s tutelage, that included, among other things, assorted models (both wood and plastic), a crystal radio set, an eleven-foot sailboat (we never quite finished) and anything we could cut out on the jigsaw and hammer together in Dad’s basement workshop. On our own, my siblings and I were often sprawled on the floor, hard at work with paper, pencils and crayons. My interests were always in visual arts, music and language. The language interest was first put to use when I received Russian language training in the Air Force. Having seldom been outside of the Midwest, a three year tour in West Berlin was an education in of itself. After the Air Force, I studied at Massachusetts College of Art in Boston and worked a few years doing illustration and graphic design. Fast forward a few years and I found myself in the lovely Garden State, close enough to experience Manhattan without having to be a full-time resident. Language played a role in my life again about this time. I met a Ukrainian couple who had, at that time, been in the States about two years. We agreed to an “tutoring exchange” arrangement – they would help me learn more Russian and I would teach them English. To give you the Reader’s Digest condensed version, I’ll just say that I met my wife Marina through this couple (who just happened to be her aunt and uncle). There have been many extreme and convoluted happenings along the way but that is your basic freeze-dried, just add water condensed version of the art nerd from Michigan. Describe your new book in a few sentences. King Norr of Nibb was not content. He longed to know of the world beyond his tiny, island kingdom. Why travel elsewhere, his people said. What place could possibly be more perfect than Nibb? What frustrated Norr even more, outsiders never came to Nibb. Foreign ships approached, hesitated, then sailed away. Why was that? And that wasn't the only mystery. Who was the little girl who sang, but would not speak? What kind of monster lurked in the bay? Had Dr Hinkus been devoured by woolly drumbkins? And most importantly, what’s for lunch? Drearily perfect Nibb was about to turn upside down. As King Norr often said, it's enough to give one "haddocks." This was the process of "writing a story backwards." First, you start with an illustration and then write a story around it. It all started with this painting -- The Return of the Quoxxel anticipated by the citizens of Nibb -- a 16 x 20 inch oil painting on panel finished in 2005. I had no idea of a story when I did this painting, yet, the image suggested it represented an event “somewhere." Apparently, it was up to me to write about it. After much trial and error, I arrived at the end product -- The Gift of the Quoxxel. They were equally fun but the most challenging had to be the pirate characters. As they were based somewhat in historical reality, I researched The Golden Age of Pirates (approximately 1660-1730) for background details and jargon of the day. What was the creative process like for you? Trial and error. That is, pursue one plot path, see where it leads. Doggedly slogging through that jungle brings one finally to a rewarding end. It says in your biography that you have written a lot of material, but never had it published. Do you intend to share this work in the future? Most of what I have written is song lyrics for melodies I composed. I read an interview with Judy Collins once where she expressed that song lyrics are not poetry. This may be true for most pop music, but the approach I took was to write words that had their own value independent of music. That being said, I’m not highly trained in music theory, so I’m in the process of having a transcriber write the sheet music from recordings I provide her. I hope to put all the songs into a collection if only to have a permanent record of them. Is there an author that had a major influence on you while you were growing up? I don’t recall any one author having a major influence on me. It was adventure enough reading Mark Twain or the various books offered by our community “bookmobile.” I recall the Hardy Boys and Tom Swift filling our home book shelves at one time. There was always something interesting to read about the house. I intend to add more illustrations and possibly some more music to “The Quoxxel” and the abilities of Kindle can be thanked for that. I’m not sure how many people know that, once purchased, the Kindle book can be updated for free to receive a revised edition. One need only contact customer service and request an “update” free of charge. I’ll be posting on The Gift of the Quoxxel Facebook page when a revision is available at which time an owner of the book can call customer service and request the update. With Kindle, we may have lost the homey, tactile quality of the paper book, but, we’ve gained other book qualities that were heretofore never imagined. To read an excerpt of The Gift of Quoxxel, go to: http://www.richard-titus.com/GotQ-01.htm.